Instructors have the option of allowing students to view the Originality Report. If your instructor has enabled this option, then the Originality Report for your 1st attempt to submission is usually created within 5 to 10 minutes of submission. Longer papers will take a little more time. If the Originality Report is Not Available, then you should contact your instructor regarding this matter. Click on the similarity percentage to open your originality report. Turnitin does not tell Instructors whether a paper has or has not been plagiarized. 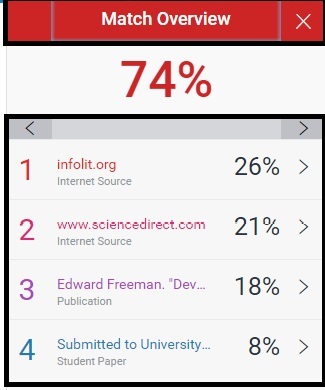 Originality Reports are just useful tools to help instructors locate potential sources of plagiarism, or text which may have been incorrectly cited. 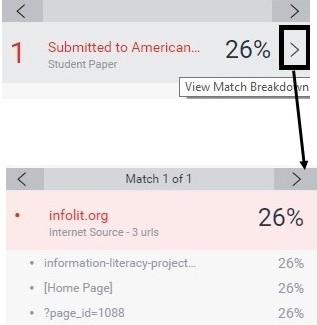 The percentage indicates the overall similarity based on how much matching text was found between the submitted file & Turnitin databases, it is ranging between 0% to 100% as shown in the photo below. The higher the similarity score, the greater the amount of similar text came up in the Originality Report. the highlighted text in your document is color coded and numbered to match the sources on the right. 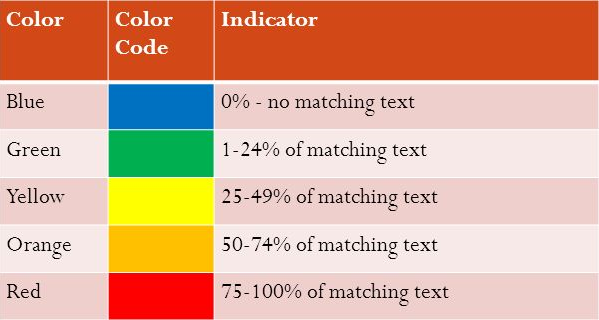 The "Match Overview" is a list of sources color coded and ordered from highest to lowest that have the greatest matches with the submitted paper on the right sidebar. Each highlighted & numbered text on the left, is referred to on the "Match Overview" box on the right sidebar. 1. To view the Match Overview, click the red similarity score from the similarity toolbar. 2. All matches are displayed within the Match Overview panel. A list of matches will be displayed in descending order. 3. To access each match in more detail, click the arrow to the right of each similarity percentage. The match breakdown will display all sources identified for each match. 4. To view the sources on-paper, either click on any source in the Match Overview, a pop up box will appear on the paper, telling the source that matched the text or click the number located left of the highlighted text. To read the full source text, click the book icon in the top right-hand corner of the box, the full source will appear on the right side panel. You can also access this source using the URL by clicking the source hyperlink in either the source box or side panel. 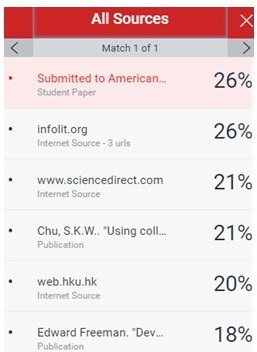 In the All Sources view, you can see all the matches found including those appeared in the Match Overview between the paper and Turnitin repositories sorted by highest percentage match. To view all sources, click the All sources icon from the similarity toolbar. All sources are displayed in a descending order within the All Sources side panel. Click on each match in the All Sources side panel, a new on-paper source box will appear.